Alpine dust insecticide is the industry's first and only Reduced Risk non repellent dust for broad-spectrum control of crawling and flying insects. Alpine Dust may be used for bed bugs, ants and stinging insects. 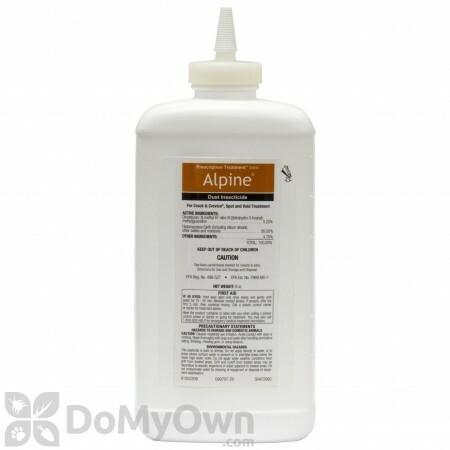 Alpine Dust is part of a family of Prescription Treatment brand Alpine insecticides that also features Alpine ant and termite foam and Alpine pressurized insecticide. All three products contain the active ingredient dinotefuran, a new non-repellent to the pest control industry that the EPA has granted reduced-risk status for public health use. 0.16 oz. - 0.32 oz. per 10 sq.ft. 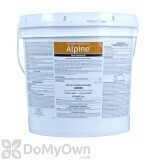 Alpine Dust Insecticide is a contact and residual powder insecticide for crack and crevice, spot and void treatment. Alpine Dust has two active ingredients for quicker kill broad-spectrum use: Dinotefuran and Diatomaceous Earth. Dinotefuran is a newer non-repellent active ingredient that the EPA has granted Reduced Risk status for public health use. Dinotefuran is part of the insecticide class neonicotinoids, neuro-active insecticides that are modeled after nicotine. Dinotefuran is a central nervous system inhibitor that takes effect after insects ingest it. Diatomaceous Earth is a completely natural insecticide made of crushed freshwater diatoms (basically tiny algae fossils) directly from the earth. When insects contact or ingest diatomaceous earth, the scratchy surfaces cut through the waxy coating on the insects’ exoskeleton, causing dehydration and eventual death. The combination of diatomaceous earth and dinotefuran helps Alpine Dust to work more quickly than many other insecticide dusts without sacrificing safety to people or pets. There is also no known insect resistance to either active ingredient. PESTS CONTROLLED WITH ALPINE DUST: Ants (excluding Pharaoh ants), Asian Lady Beetle, Bed Bugs, Bees, Black Carpet Beetles, Boxelder Bugs, Centipedes, Cigarette Beetles, Cluster Flies, Cockroaches, Confused Flour Beetles, Crickets, Darkling Beetles, Drugstore Beetles, Earwigs, Elm Leaf Beetles, Firebrats, Fleas, Fruit Flies, Furniture Carpet Beetles, Ground Beetles, Hornets, House Flies, Indianmeal Moths, Lesser Grain Borers, Merchant Grain Beetles, Millipedes, Paper Wasps, Phorid Flies, Pillbugs, Red Flour Beetles, Rice Weevils, Rusty Grain Beetles, Sawtoothed Grain Beetles, Silverfish, Southern Fire Ants, Sowbugs, Spider Beetles, Spiders (excluding Black Widow and Brown Recluse spiders), Stable Flies, Varied Carpet Beetles, Warehouse Beetles, Wasps, Webbing Clothes Moths, Yellowjackets. Alpine Dust can be used for almost any treatment when an insecticide dust is appropriate. Alpine Dust is lighter and, therefore, yields more coverage than many other dusts. Alpine Dust has a broad-spectrum label for many common applications and pests, including bed bugs. Alpine Dust is also effective on pyrethroid-resistant strains of bed bugs or cockroaches. With its Reduced Risk status, Alpine is a perfect choice for sensitive accounts such as hospitals, schools, or nursing homes. Alpine dust can also be used as an outdoor crack and crevice treatment or mulch treatment. This product is intended for application with a hand duster like the Bellow Hand Duster or powder duster, or other dusters, to cracks and crevices, voids, hiding, runway and nest areas and those places where pests are found. In living areas, make applications in such a manner as to avoid deposits on exposed surfaces or introducing the material into the air. Treat a small area of the surface to be treated to observe for staining or other adverse reaction before making regular application. Apply lightly and uniformly to infested areas. Pay particular attention to cracks and crevices; service ducts; false floors and ceilings; wall voids; around electrical and telephone fittings and equipment; around water and sewer pipes; under and behind cabinets, refrigerators and sinks; around window and door frames; along baseboards; in attics; and crawl spaces. Apply between 0.15 – 0.3 oz. per cubic yard. Repeat treatments as necessary. An 8 ounce bottle covers 250-500 square feet. A 3 lb. pail covers 1,500 to 3,000 square feet of total surface area, keeping in mind that dust is only applied as a crack and crevice, spot, or void treatment. In and around residential and commercial buildings and structures and modes of transport, including: Apartments, Campgrounds, Homes, Hospitals, Hotels, Industrial Buildings, Laboratories, Motels, Nursing Homes, Office Buildings, Resorts, Schools, Stores, Supermarkets, Transportation Equipment (Buses, Boats, Ships, Trains, Trailers, Trucks, and Planes), Utilities, Warehouses and other Commercial and Industrial Buildings, Nonfood/nonfeed areas of Food/Feed Processing Facilities. Apply thoroughly to all areas where pests crawl and hide, especially in cracks and crevices, voids and hidden surfaces around sinks and storage areas, behind baseboards, around doors and windows, behind and under refrigerators, cabinets, and desks, sinks and stoves and attics and crawl spaces. For invasive pests, treat other places where pests may enter. Direct contact with dry dust is required to be effective. Bed Bugs: Apply to cracks and crevices where evidence of bed bugs occurs. This includes bed frames, box springs, inside empty dressers, clothes closets, and carpet edges, high and low wall moldings and wallpaper edges. Do not use Alpine Dust on mattresses, pillows, bed linens or clothes. Reapply as necessary. Not recommended for use as sole protection against bed bugs. Stinging insect such as bees, wasps, hornets, and yellow jackets: It is generally advisable to treat wasp and bee nests in the evening when insects are less active and have returned to the nest. Wear protective clothing if deemed necessary to avoid stings. Using hand or power duster, thoroughly dust nest and entrance and surrounding areas where insects alight. Nests in voids should be located and treated. Treat entrances and drill a hole in the void(s), blow dust in, and reseal. For best results check nests carefully one or two days after treatment to ensure complete kill. Direct contact with dry dust is required to be effective. Perimeter Treatment: Make a treatment around and in cracks and crevices or voids associated with windows and doors, porches, screens, eaves, patios, garages, under stairways, and in crawl spaces and other areas where pests hide. Dust should not be exposed to rain or wind. Broad use label for inside and outside non-food handling areas. Long-lasting non-pyrethroid control of ants. Lightweight for better coverage and more applications per pound than leading dust. Do not use in food/feed handling areas of food/feed processing facilities. Dust should be applied with a hand, bulb, or electric duster. Do not use on animals or pet bedding. Dust that spills or may be left in exposed areas can be wiped up with a wet paper towel. Do not use on mattresses, linens, or clothing for bed bug or other treatments. I used this in conjuntion with Temprid (and Gentrol) after Suspend SC and prythrin based dusts didn't solve bed bug problem. The combination knocked the crap out of the bugs. I had read every study on bedbugs and we cleaned, disposed of, isolated and wash clothing, etc. We washed and vacuumed carpets. The combination of Temprid, Gentrol and Alpine stopped the problem cold. I have also purchased Phantom and intend to follow up with it just because of all I have read but it seems almost meaningless as the bugs got clobbered already. I was stunned out how fast DMOPC is at responding to questions and how fast products arrived at normal shipping rates. This is a business that understands service and DESPERATION for relief. Don't buy the bombs from the hardware stores...it disperses the bugs. Don't use a pyrthrin based (or synthetic) insecticide-the bugs swim in that stuff nowadays-get Temprid or Phantom or both. They work. And Alpine dust-and dust everywhere (inside outlets, bedrails, baseboards, etc). Temprid has a residual kill rate of almost 100% for six months in university studies. Note to people with ant problems: with the exception of Pharaoh ants, I STRONGLY recommend using Alpine. Pyrethrins are very effective, but their repellent properties may make a problem worse. I've solved several "problem" ant accounts with this product. They willingly walk right through it and transfer it throughout the rest of the colony. I mixed 80% Alpine and 20% Eco PCO dusts in the bulb, then applied it to the patio door where Springtails were gathering. Works well. Watched them walk on it for 2-3 days then they disappeared or died. Did a great job on yellow jacket nest lodged in bricks! My house was built in 1895 and through a small hole in the brick, above the window, I started seeing yellow jacket activity. After calling local pest control and getting stiff quotes of $250, I purchased this and Long Shot Puffer Duster. I went out at night and dusted the hole and surroundings. The next day -- No more yellow jacket activity; not one. I couldn't believe it. I saved a bunch of money too. Problem solved. A guy on youtube recommended this website. I don't normally recommend things, but this did exactly what I needed. Good luck! Why do you use Alpine Dust if you use steam? How does Alpine Dust work? inside empty dressers, clothes closets and carpet edges, high and low wall moldings and wallpaper edges. Do not use this product on mattresses, pillows, bed linens or clothes. Remove all clothes and other articles from dressers or clothes closets before application. Reapply as necessary. Direct contact with dry dust is required to be effective." Is Alpine Dust water proof? No. The only dust on the market that is water proof is Delta Dust. what makes this different than your previous D.E. product which has been discontinued? The Mother Earth D.E. has not been discontinued. Our website states that the manufacturer of the Mother Earth DE no longer carries/produces it in the 8 oz size bottle, only the 10lb bucket. The Alpine DE is made by a different company and does come in the smaller 8 oz size. The Alpine has 95% DE and .25% Dinotefuran which gives a quicker knock down of the pest over the Mother Earth which is only 100% DE. Both can be used in the same areas of a home and both are still very safe products to use. Please let us know if you have any other questions. How long is the residual of Alpine Dust? I keep seeing comments about the “long lasting residual” but I have yet to see an actual duration. I understand that it will only kill on contact; however, I need to know how long after I apply the dust that it will kill a bedbug who comes into contact with it? Typically, the Alpine Dust will remain effective for about 6 months as long as it is left undisturbed. Should I wear a face mask while doing the dusting with Alpine Dust? It is typically recommended to wear a mask when applying the Alpine Dust because it is such a fine dust.